A number of media stocks are gearing up to report earnings this week, and one top technician says Disney could be set to soar. Shares of the media giant were in rally mode Monday, hitting the highest level since November 2015. 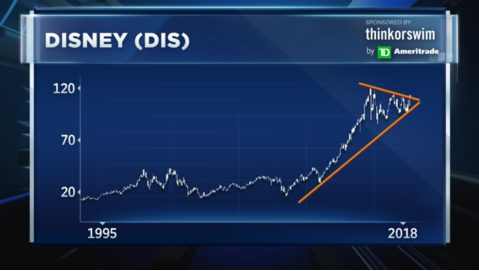 According to Carter Worth, head of technical analysis at Cornerstone Macro, there's something in the charts implying an even bigger breakout ahead. "We're contending with a high and we are setting up for a presumptive breakout," Worth said Friday on CNBC's "Options Action." Shares of the media company are up more than 11 percent in the last month. Despite its most recent outperformance, Disney has lagged the broader market in the longer term. Since 2015, the company's shares have risen 7 percent, well behind the S&P 500 which has surged nearly 37 percent in the same time period. Nonetheless, Worth believes Disney is now poised for a catch-up. 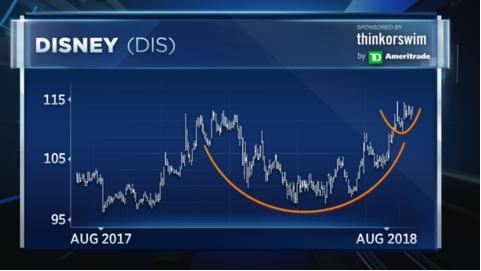 Looking at a one-year chart, Worth illustrated a bullish cup and handle formation. This reveals that after selling off in the beginning of the year, shares of Disney have more than retraced their losses, suggesting sentiment around the name may be shifting to the upside. "I like the outperformance of [Disney] in the last month ... with the precondition of three years of underperformance," Worth said. In the past 20 years, Disney has soared nearly 300 percent. However, shares of the media giant have struggled to break through its all-time high of $122.08 set in 2015. Irrespectively though, Worth believes the stock's recent move through the $110 level shows Disney has "actually broken above the upper band of [a] wedge." "What I'm thinking here is [a] pretty big move," he said. "[I'm] buying Disney into earnings." Disney is expected to report its latest quarterly earnings after the bell on Tuesday. Shares of Disney were up 1.7 percent on Monday afternoon at around $116.